I have started microstock photography about 2 years ago and for about that time I read in this forum. This is my first post today. My second passion is programming and since I changed from iOS to Android 2 month ago, I started to code a microstock contributor app. It is called StockAgent and allows the user to check more than 60 for new sales. On www.pixel-nest.com you get more details. Here you find news and version history. whats the main difference between the free version and the premium version ? can i buy the premium version form the free? It is not possible to buy the premium version from the free. You should backup your data from the free with "Backup and Restore" from the app and restore it in the premium when you bought it. So there is no need to enter all logins again and you don't loose your income data from this month. - A Badge Mode showing the sales on the App icon after a configurable interval. - Notifications of new sales (with special cash sound). What would be a fair price for you? As I said, it is my first app project. I think I have to learn a lot. In my opinion, ads are not the way to go. Btw, here in my country the price for the app is much lower than a beer on the Oktoberfest. Yes, statistics are planned for future releases. We just released a new version. 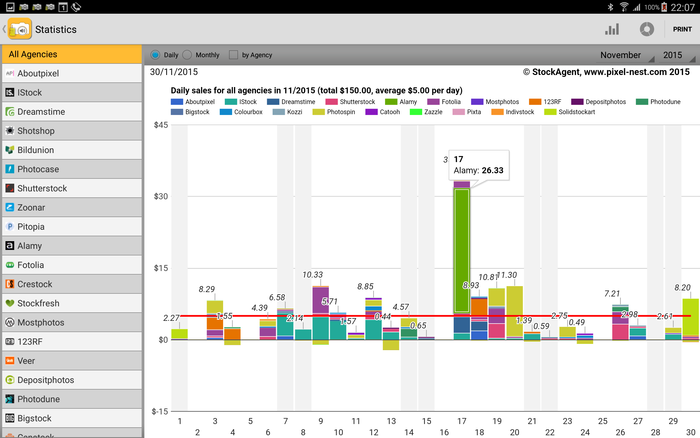 The most important new feature is the detailed and interactive daily, monthly and yearly statistics. Print and save as PDF on Kitkat and above. - Shutterstock: Implemented view for recently sold images. The new version 2.2.0 should be available on Google Play in the next hours. Thank you for buying StockAgent! I think, "paying again" would be the correct description for a subscription pricing model. That's where you have to pay every year for the same old features. In my opinion, this is unfair, right? Paying for new features as an option does not hurt anybody who does not need them. 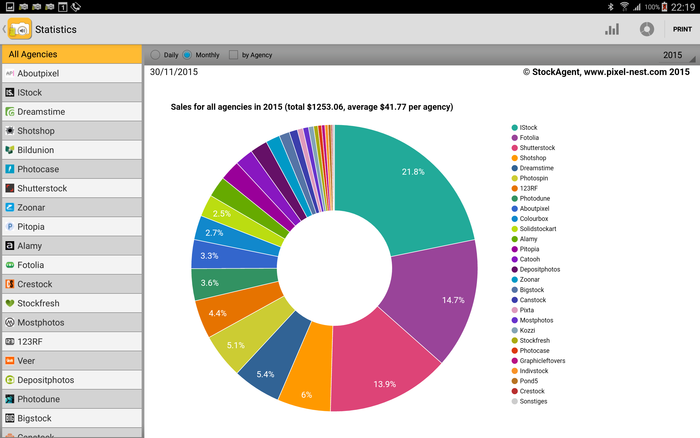 I implemented the new agencies on customer demand. So it is just a little compensation for the extra work. That's a problem of the first month when you start using the app. Next month will look much better for you. - Or skip the first run completely. I'd think the easiest implementation would be to just use the first run as a starting point and not show them in the graph. The point in my case is that I happen to have a larger amount of royalties sitting in my accounts than I would typically make in a month. So even if I wait month, the November bar will still look small compared to what I see for October right now. And the distribution pie chart will only start to show realistic values in 2015 if I understand the calculations correctly. So for me the value of the app is limited to quickly check how much I made today which is quite okay because that's the main purpose for me. But if you have nice charts in there, I'd love them to show realistic values. There is a workaround for this problem. We can use the Backup/Restore functionality to export the current values, edit them and restore the file with the new values. The file format is ASCII CSV aka Excel data. - In StockAgent go to Backup/Restore menu and press Backup. The files are written to the path under Location. - Connect your device via USB to a PC. Open an explorer window and navigate to device\[Location]. - Copy the file [date]_StockAgent.SAbak.1 to your PC's harddisk. Here in this case "2014-09-23" is the first run date. 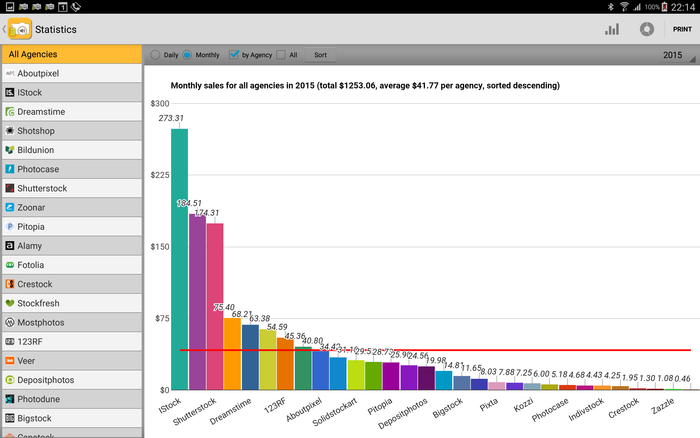 So you should set the values in the 3rd column to the income you want. But be careful: The format has to be like "0" or "1.23". - Save the file and copy it back to your device. Replace the original ...SAbak.1 file. - In StockAgent press Restore and select the backup. The new version 2.2.2 should be available on Google Play in the next hours. The new version 2.2.3 should be available on Google Play in the next hours. If you would sopport iOS, I would try it out. Stocksy and IOS support would be nice. Very nice. What does "optional" mean? extra cost? Stocksy seems to be a closed community at the moment. It is impossible to create a new account. Btw. version 2.2.4 is uploaded to Google Play with bugfixes for zazzle, photospin and colourbox. Now I have an issue because 123RF apparently had a bug this week, so for a day or so the app read my balance as $0. The next day, 123RF was up again, my balance was $31. The app apparently considers the $31 as new income because of the 0 value the day before. So as a result 123RF is being reported with $60 this month, $29 from the time before the bug appeared plus $31 from the day after. I think that is a general flaw if you only check the account balance in comparison to the data stored for the day before. I didn't try this yet but what if I'm traveling for a day or two and don't have the app update its data? I guess the day I come back all data will then be reported as new income on a single day as well, right? The app is still a nice toy for those who want to check if they had new downloads during the day. So the average hobbyist will probably be fine with this. But I think the stats part needs to be worked on, otherwise it will just be wrong numbers in nice colors. That's why the "Edit" feature is implemented. Nobody can guarantee the availability of the web servers of every agency. So what should happen if they deliver $0? In some cases it was a payment in other cases it is a failure. With the Edit feature you fix this by yourself and manually set the value you want. Right, works as designed. Many agencies do not deliver daily statistics. That is the only way to have them checked. But I think the stats part needs to be worked on, otherwise it will just be wrong numbers in nice colors. Did you try the solution I gave you some posts before? I think it won't take longer than 2 minutes editing the CSV file and restore it in the app. The new version 2.2.8 should be available on Google Play in the next hours. 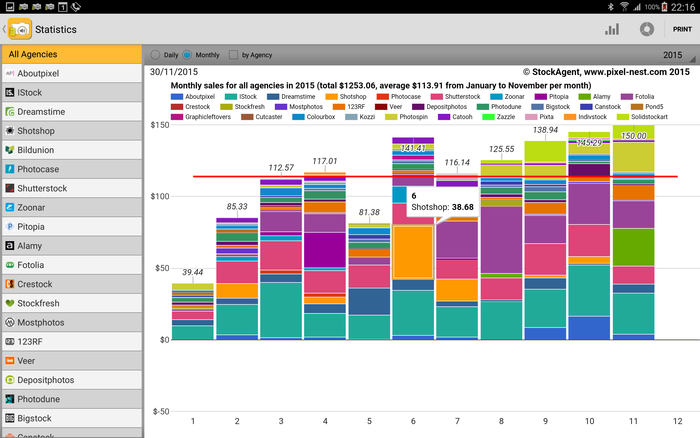 Version 2.3.1 enhances the usage of the statistics. 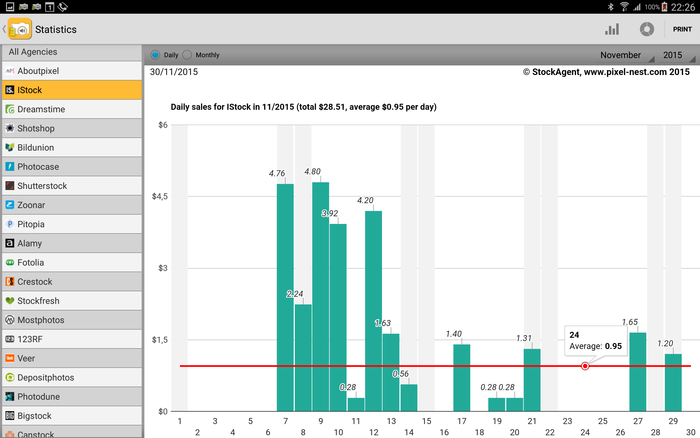 - Via settings the user can set a start date for average calculation. For example, if you started using the app this month you will get the current amount for all your agencies. As these values are not only your income from this month the average income calculation for this year would be wrong. 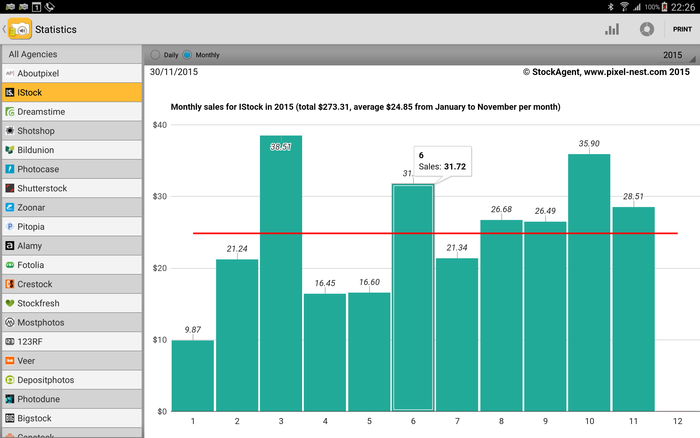 Setting the start date to the next month will fix it and shows the correct average from that month on. - There is a new option in the settings which lets the user define a threshold for payments. Bigger amounts are not shown in the statistics. Usually monthly payouts could be suppressed in the graphs this way. The new version 2.3.3 should be available on Google Play in the next hours. Thanks to Snowblood for your support! - You ask for email for the Bigstock, but it works only with the username. - Tried to add 500px from the "optional" agencies, but I get the message "error - you need to be logged in to google play" - which I am, or my play store would not work (I think). What can I do? I fixed Colourbox and Shutterstock yesterday and will upload today. 123rf introduced a reCaptcha to protect the income data on their site. Probably StockAgent can no longer support the agency because of it. In 123RF maybe the data could extracted from "Download" where the captcha is not needed to access? Thanks for the hint. I thought about it in the last days. But this will not work because the app could not check for payouts as they are not listed there. I have contacted 123rf's support 2 times because of this so far but without any response. Maybe it could help if app users contact them too? Let me know if they respond. And re-implemented Shutterstock detail/thumb view. The new version 2.5.0 should be available on Google Play in the next hours. Hi. Stockagent shows a sudden income of 4300 and then some Dollars for iStock today, which - needless to say - I did not earn. Actually, today I did not sell a single file. The amount does not correlate to any other sum i can think of, like total earnings etc. The same here. Not 4300 but another very high amount. I used EDIT to set the old value. I haven't seen this before with IStock. Let's wait and see if it appears again. It is a bug in StockAgent. Will upload new version tonight. I did update, but... today I earned 5900 Dollars. Maybe instead of istock, the app is monitoring my wildest dreams? Edit: Balance was corrected overnight, but it's still in the stats. As you may know 123RF introduced two weeks ago a captcha to their income page. This locks out any third party to read programmatically the total amount. To overcome this I have just uploaded StockAgent 2.5.6. There is one small limitation. The user has to set an income offset in the login setting page. This offset is the amout you earned until the end of the last month. My total income with 123RF is today $56,78. My income for this month is $2,34. So I have to enter $54,44 as my personal offset. You only need to adjust this offset if there is a payment. I hope this is acceptable instead of removing 123RF completely or showing unreadable captchas. * All agencies are included for free in the premium version now! No more in-app purchase! I just installed your app and it seems like fun! I only have troubles with bigstock: it says i have no sales at all. I also can't log in at vectorstock (my email and password are correct!). And Zazzle keeps telling me i have a sale of $0.06 every 5 minutes; and after 20 sec it says -$0.06. Vectorstock is fixed in 3.2.14 which I just uploaded on Google Play. Bigstock is working here with my accounts. Did you double-check your email and password? Anybody else with problems on Bigstock? Is zazzle still a problem? 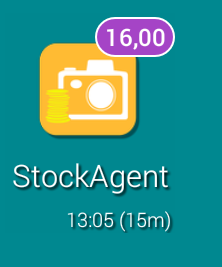 Please set "Notification Threshold" in StockAgent's setting to a value of 0.06 or above to avoid the useless notifications. I installed the update and vectorstock and bigstock are working now. Great! Bickstock gave a green number, but still didn't work, but as the update resolved it.....it doesn't matter anymore. Zazzle keeps saying me every update that i have a sale of $0.06 (and quickly afterwards -$0.06). I filled a notification threshold of $0.1, so that they stop sending me notifications. Maybe the problem is that i am payed in Euro; and with the conversion rate to $ it keeps going up and down??? 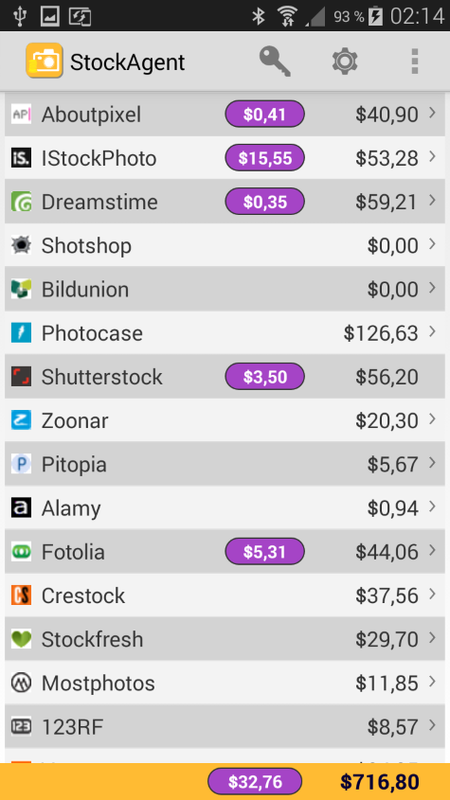 Zazzle (and Fotolia) are the only sites that pay me in Euro, so i choose $ for your app. The only account that makes a little mistake is 123rf, the app is showing a few cent less than what i earned for real. wow, you really bought your first smartphone for tracking your sales? So you chose Android because StockAgent isn't available on Apple? Sounds very good to me! I appreciate it! I am glad to hear that bigstock and vectorstock are working for you now. With Zazzle it is the same for my account here. As the conversion rate has variations I have these little ups and downs too. This is why I implemented the threshold. Thanks again for using StockAgent and contacting me. I wish you always good sales! Currently there is a lack of suitable hardware. I believe you can run OS X in a virtual machine, and use the iPhone simulator in xCode. I'm not a dev though, might not work! Bad Behavior has blocked 62293 access attempts in the last 7 days.